A short-form tabletop RPG for two players. Collaborate as hunter and prey to tell a thrilling story together. 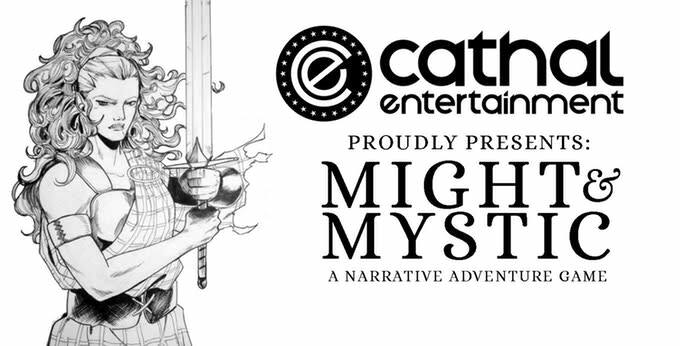 MIGHT & MAGIC is a NARRATIVE ADVENTURE GAME for your next GAME NIGHT! So in the same way that works such as Lord of the Rings and Dungeons and Dragons is Eurocentric, Swordsfall is Afrocentric. The underlining lore is built from the history of pre-colonial Africa. Swordsfall has several components to the project; World Anvil, novels, a Tabletop RPG and informational YouTube videos about the research I’ve uncovered. A City Setting for Old School RPGs – The Midderlands setting compatible. An RPG of Criminals, Cops, Mystery, and Monsters…with Super-Powers! Mud & Blood is a podcast focused on tabletop roleplaying games of a dark & grim nature, made up of Matt Kay and Liam Stevens. Liam brings his Kiwi charm and philosophical nature to counter Matt’s mid-Atlantic matter-of-factness. It’s a great combination (if we can say so ourselves!) that seems to be striking a chord with a fair number of roleplayers out there. A map-making tool for role-playing games. New sci-fi themed, skirmish scaled maps for use with miniature games and RPGs. Den efterlängtade magimodulen till Eon IV. That’s an awesome list! Extremely handy and I’m so happy to have found out about its existence. I think you might be interested in news about the new in-development tabletop hard sci-fi RPG, Project Aphelion (www.projectaphelion.com) – the author is not only working on the RPG itself but also on short stories and novellas set in the universe – well, our universe, just a bit in the future. Might be worth following! Thank you, I am always glad to get feedback.